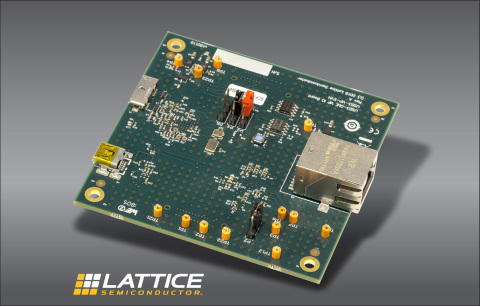 PORTLAND, Ore.--(BUSINESS WIRE)--Lattice Semiconductor Corporation (NASDAQ: LSCC), the leading provider of customizable smart connectivity solutions, today announced the release of the USB3-GigE VIP IO Board, extending the design interface options with the Video Interface Platform (VIP). Based on Lattice’s award-winning Embedded Vision Development Kit, the VIP platform offers embedded system designers the flexibility of interchangeable input and output boards to simplify connectivity to a broad variety of video interfaces. The newly released USB3-GigE VIP IO Board complements existing VIP offering consisting of the ECP5™ VIP Processor Board, CrossLink™ VIP Input Bridge Board, HDMI VIP Input and HDMI VIP Output Boards, and DisplayPort™ VIP Output and Input Boards. The modular VIP platform provides designers with the ability to build an embedded vision prototyping system quickly by mixing and matching different input and output boards, eliminating cumbersome manual wiring and enabling faster time-to-market through a unified connector. At the base of the platform is the Embedded Vision Development Kit which combines the benefits of the CrossLink mobile bridging FPGA, the optimized ECP5 image signal processing FPGA, and the high-bandwidth, high-resolution HDMI ASSP onto a single, ready-to-use design platform. Lattice’s new USB3-GigE VIP IO Board enables Ethernet connections at gigabit speeds and USB 3.0 connectivity, extending the VIP interface options, and ensuring simplified prototyping for embedded vision systems. In addition to a variety of hardware options, Lattice’s VIP offers IPs from 3rd party VIP ecosystem partners. IP options include commercial grade Image Signal Processing and networking stacks, Helion Vision’s GigE Vision, and a variety of different sensor input boards and DisplayPort IP (including eDP support) from Bitec. For more information about Lattice’s VIP ecosystem and the USB3-GigE board, please visit http://www.latticesemi.com/VIP. For more information about Lattice’s Embedded Vision Development Kit, please visit http://www.latticesemi.com/en/Products/DevelopmentBoardsAndKits/EmbeddedVisionDevelopmentKit. Lattice will be exhibiting at Embedded Vision Summit 2018 in Santa Clara from Tuesday, May 22 to Wednesday, May 23, where members of the Lattice team will showcase some of its latest advancements in Edge connectivity and Edge computing solutions in the Industrial, Automotive, and Consumer markets. To schedule a press meeting, please contact: lattice@racepointglobal.com. To schedule a customer meeting, please visit: http://www.latticesemi.com/en/About/ContactUs.aspx. Lattice Semiconductor Corporation, Lattice Semiconductor (& design), ECP5, CrossLink, DisplayPort and specific product designations are either registered trademarks or trademarks of Lattice Semiconductor Corporation or its subsidiaries in the United States and/or other countries. The use of the word “partner” does not imply a legal partnership between Lattice and any other entity. Lattice expands VIP platform, offering embedded system designers the flexibility of interchangeable input and output boards to simplify connectivity.